José C. Feliciano was born in Yauco, Puerto Rico and was reared on the near west side of Cleveland. He has been a Partner in the Litigation Group in the Cleveland office of the national law firm of Baker & Hostetler LLP since 1987. Prior thereto, he made history by serving as the first Hispanic public official in the history of the City of Cleveland by serving as the city’s chief prosecuting attorney. The culmination of his public career was Mr. Feliciano’s selection as a White House Fellow by President Ronald Reagan in 1984. Earlier in his career, he was a Cuyahoga County Public Defender and was an attorney for the Legal Aid Society. He has also been an adjunct professor at John Carroll University. He holds a B.A. from John Carroll University, a J.D. from the Cleveland-Marshall College of Law, and an M.B.A. from Cleveland State University. A member of the American College of Trial Lawyers, Mr. Feliciano has more than 37 years of experience in complex commercial and employment litigation. His trial experience has included business litigation, products liability, construction, shareholders’ derivative suits, contracts, eminent domain, and commercial and personal torts. Mr. Feliciano was elected to the American College of Trial Lawyers in 1995, he has been consistently listed in the Who’s Who in American Law, and he is consistently recognized as an Ohio Super Lawyer and listed in The Super Lawyer in Business for Corporate Counsel and Fortune 1000 Decision Makers. Mr. Feliciano is deeply committed to advancing the Hispanic community in Northeast Ohio. He is the founder and Chairman of the Hispanic Roundtable. He is also the former Chairman of the Hispanic Leadership Development Program and founder of the Hispanic Community Forum, for which he also served as President. Additionally, Mr. Feliciano was a founder of the Ohio Hispanic Bar Association and served as its Vice President. He is a past general counsel for the Spanish American Committee. In his role as Chairman of the Hispanic Roundtable, Mr. Feliciano hosted a monthly talk show on El Sol Television, produced by El Sol De Cleveland Hispanic newspaper. Mr. Feliciano and his guests discussed topics relevant to the Hispanic business and professional community of Northeastern Ohio. He wrote a regular column on legal issues in El Sol newspaper and has written book reviews for the Cleveland Plain Dealer. Today, he is an aperiodic columnist for La Prensa newspaper. Mr. Feliciano has a long history of other community involvement, including service on the board of the following organizations: Cuyahoga County Transition Group (Executive Committee), John Carroll University (Vice Chairman), St. John Hospital, United Way Services, Greater Cleveland Roundtable, Ohio Motorist Association (AAA), Case Western Reserve University Visiting Committee (Chairman), Cleveland-Marshall Law School Visiting Committee, Cleveland Ballet, The Cleveland Children’s Museum, New Cleveland Campaign, Spanish-American Committee, National Conferences of Christians and Jews, Cleveland Council on World Affairs, and WVIZ (Public Television). Mr. Feliciano currently sits on the following boards: Hispanic Roundtable (Chairman and Founder), Greater Cleveland Partnership, Global Cleveland, Midwest Coalition on Immigration (Twelve State Initiative of the Chicago Council of Global Affairs), Commission on Economic Inclusion (Executive Committee), and MWV Pinnacle Capital Fund Advisory Board. Mr. Feliciano has been equally involved in the Bar. He is a past president of the Cleveland Bar Association. Mr. Feliciano served on the Board of Governors of the American Bar Association from 2001 through 2004, and since 1998 he has been elected on a nationwide level to the House of Delegates of the American Bar Association, the congress of the legal profession. In addition, he has chaired the Section of Dispute Resolution of the American Bar Association (1996-1997) and has represented the American Bar Association to the National Conference of Commission on Uniform State Laws. More recently, he has served on the A.B.A.’s Standing Committee on Federal Judiciary (2006-2010) which reviews all nominees to federal judgeship, including the United States Supreme Court, and reports to the Senate Judiciary Committee, Justice Department, and the White House. He currently sits on the A.B.A.’s Standing Committee for an Independent Judiciary. 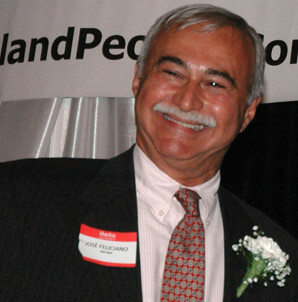 Mr. Feliciano was honored by the American Bar Association in 2005 with the “Spirit of Excellence” award, given by its Commission on Racial and Ethnic Diversity in the Profession. In 2008 he was named Chairman of the Advisory Group for the United States District Court for the Northern District of Ohio. Mr. Feliciano has received a number of awards and honors for his professional accomplishments. He was initially recognized for his public service in 1983 when, as a prosecutor for the City of Cleveland, he was awarded the Ernest J. Bohn Public Administrator’s Award, Public Administrator of the Year in Cuyahoga County. Cleveland State University granted its Distinguished Alumni Award in Law and Business to Mr. Feliciano in 1990, and the Cleveland State University Nance College of Business elected him into its Hall of Fame in 2010. He was also recognized by the Cleveland-Marshall Law Alumni Association as an Alumnus of the Year in 1998. ORT granted Mr. Feliciano its Jurisprudence Award in 2009 and Crain’s Cleveland Business listed him in its “Who’s Who in Business” in Cleveland in 2010. In recognition of his community service, the U.S. Jaycees selected Mr. Feliciano as one of the Ten Outstanding Young Men in America in 1984, an award received by, among others, John and Robert Kennedy, Henry Kissinger, and Elvis Presley. The American Nationalities Movement granted Mr. Feliciano its civic achievement award in 1990, and the Ohio Commission on Spanish Speaking Affairs recognized Mr. Feliciano in 1996 as a Distinguished Hispanic Ohioan. Nueves Horizontes Newspaper recognized him as its Hispanic of the Year in 2000. The Federal Bar Association granted him its Boots Fisher Civic Achievement Award in the same year, when he also received the Hispanic Political Action Committee Civic Award. Most recently, he is a recipient of the John Carroll University’s Alumni Association Alumni Metal (2012). Mr. Feliciano, who resides in Chagrin Falls, has been married for 37 years to his wife Molly, with whom he has three children: José Jr. (33), Rebecca (30), and Marisa (27). He has a grandson: Ciarán (3 months).